HWPH AG - Historische Wertpapiere - Chaplin Studios, Inc.
State of California, 12.02.1923, 1.099,36 Shares á US-$ 100, #10, 21,9 x 32,9 cm, grün, schwarz, Knickfalten mit Einrissen an den Enden, vier Steuermarken, schriftenwertet, Erhaltung VF, ausgestellt auf Charlie Chaplin und von ihm drei Mal original signiert (2 x vorne, 1 x rückseitig). Das Zertifikat verbriefte 55 Prozent des Grundkapitals! Nur die Nummern 1 bis 10 der Chaplin Studios wurden von Charlie Chaplin original signiert. Mit dem angebotenen Stück wird erstmals ein Chaplin-Triple auf einer Auktion angeboten wird! Eine der größten Raritäten unseres Sammelgebietes! Die Aktie der Chaplin Studios hat alles, was ein ultimatives Highlight der Scripophilie ausmacht: Sie verkörpert einen Anteil von 55 Prozent am Lebenswerk einer Legende, ist gleich dreifach von dieser Legende, von Charlie Chaplin signiert. Nur die ersten zehn Aktien der Chaplin Studios (meist einfach signiert) wurden überhaupt von Charlie Chaplin signiert. Ab Nummer elf zeichnete Alfred Reeves als President. Nutzen Sie also diese einzigartige Chance und sichern Sie das erstmals auf einer Auktion angebotene Stück für Ihre Sammlung! State of California, 12 February 1923, 1,099.36 Shares á US-$ 100, #10, 21.9 x 32.9 cm, green, black, folds with tears, four revenue stamps, pen cancelled, condition VF, issued to Charlie Chaplin and signed three times by him (two on front, one on back). The certificate represented 55 per cent of the total share capital of the company! 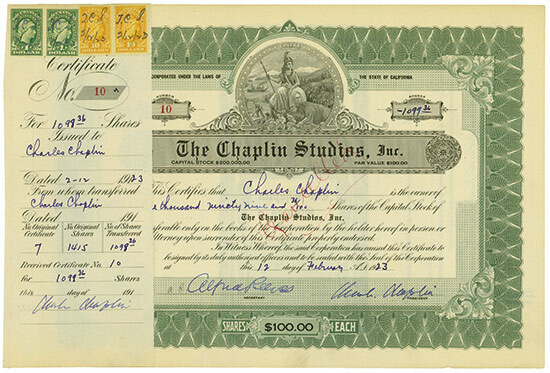 Only the numbers one to ten of the Chaplin Studios were signed by Charlie Chaplin himself. This is the first time, that a Chaplin-Triple is offered on an auction! One of the greatest rarities of Scripophily! 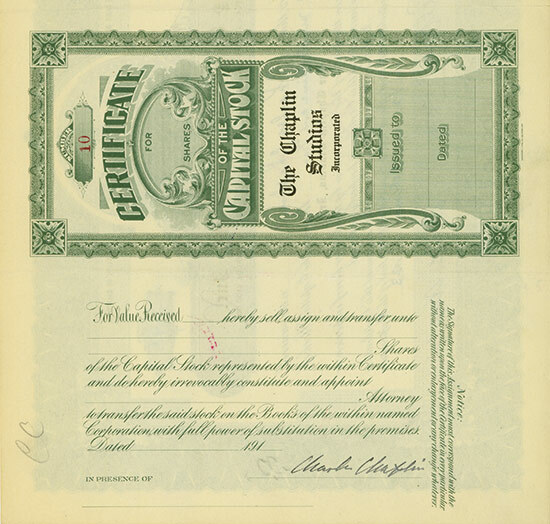 The share of the Chaplin Studios has everything, which makes a certificate an ultimate highlight of Scripophily: It represents 55 per cent in a lifework of a legend, it singed three times by the legend, signed by Charlie Chaplin. Only the first ten shares of the Chaplin Studios bear the original signature (most with one signature) of Charlie Chaplin. Starting with share number eleven Alfred Reeves signed as president. Take your chance and ensure this certificate, which is offered first time on auction, for your collection!